To say that I was excited about seeing Les Mis was an understatement. I could hardly sit still in the train on the way to the cinema. I’d been so looking forward to seeing the movie since they started shooting scenes in Greenwich in April 2012. Les Mis is one of three of my all-time favourite musicals (the other two being Miss Saigon and Phantom of the Opera) and the prospect of seeing a movie version of the musical was certainly exciting. I told myself to not expect too much, because after all, the cast weren’t West End or Broadway performers. But I also knew that Cameron Mackintosh had a say in the production and after seeing the interviews, I understood that the cast and crew understood how beloved this musical was that they wouldn’t do anything to taint it. I’m sure everyone involved in the movie wanted to do their utmost best because like me and countless others, they loved the musical too. So after waiting for so long (waiting to get better from illness and waiting for the snow to stop falling and start melting), armed with Kleenex, I made my way to see the movie I’d waited to long to see. And it didn’t disappoint. I cried buckets, enough to make my eyes sting the whole time after. The familiar themes of young love, unrequited love, transformation, forgiveness and redemption did not fail to touch my heart (and my tear ducts!). While live theatre performance is in a different league entirely, this version of Les Mis was something to be seen. You could see in the actors’ performances how much they loved this musical. Hugh Jackman reminded me a little of Colm Wilkinson, but don’t get me wrong, his Valjean was his Valjean. Amanda Seyfriend was a hauntingly beautiful Cosette, and she didn’t warble too badly too! Anyone who can cry and sing at the same time as well as Anne Hathaway did deserves an award! I was quiet pleased that they chose Samantha Barks for Eponine because she did brilliantly. 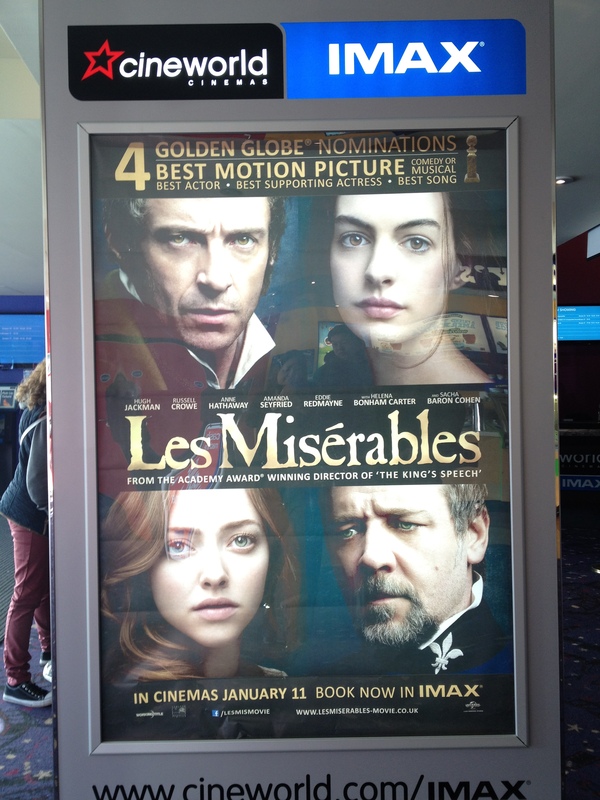 I wasn’t too impressed by Russell Crowe’s singing but his acting made up for it because he was Javert! But I think the performance that stole the show was Eddie Redmayne’s! Who’d have thought he’d make this amazingly romantic Marius? I don’t really want to say too much just in case you haven’t seen it. But if you can go and watch it, do! Oh and remember to bring kleenex…or maybe a beach towel! I’m definitely seeing this! So glad you loved it!